On Auctions managers can buy new players and spend their coins. 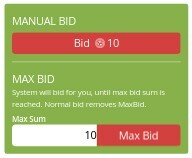 - Max Bid - set the biggest price you could spend for this player. If another manager bids on this player, the max-bid system will overbid him automatically instead of you. When the auctions is over, the player moves to his new team (if somebody won the bid war) or moves to his previous team (if nobody bid for him).